My amazonite necklace is a stunning green colour. 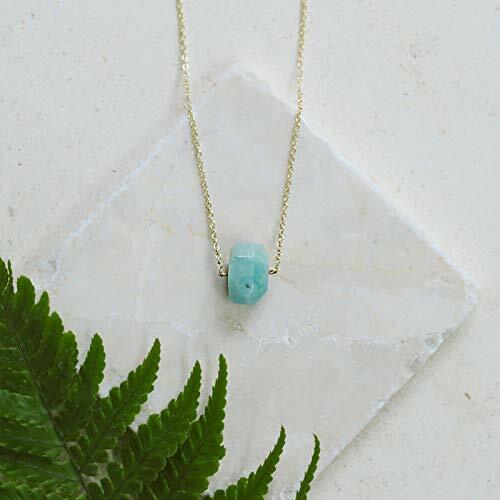 It has been handcrafted in 14k gold fill.The amazonite nugget necklace features a polished faceted amazonite crystal which is attached to a sparkling chain that catches the light. 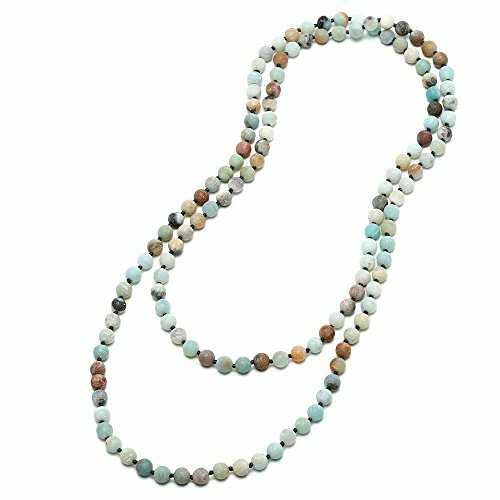 The amazonite crystals are fairly chunky and are approximately 11-15mm wide and 14-19mm long.I use natural gemstones, so your amazonite necklace may have a slight size and shape variation from the main images.The necklace is adjustable to fit 16-18 inches long and fastens with a spring clasp. About Amazonite: Amazonite is named after the powerful Amazon women. Its healing powers are thought to be as strong as the great Amazon river. It is known as the stone of courage and truth. This crystal soothes the spirit and calms the soul. Amazonite represents kindness, peace, creativity, and love. It is a birthstone crystal for March and April, and the zodiac stone of Virgo (23rd August - 22nd September) and Capricorn (22nd December - 19th January). Your jewelry has been designed and handmade with love using genuine gemstones and crystals. It is packaged in a beautiful jewelry gift box along with a fact card telling you all about the crystal and its meaning. My amazonite necklace is a stunning green colour. 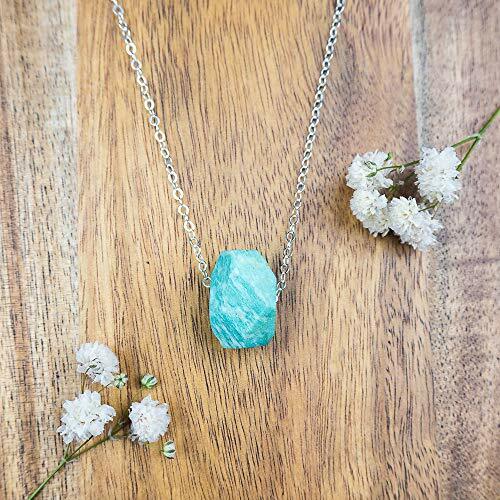 It has been handcrafted in sterling silver.The amazonite nugget necklace features a polished faceted amazonite crystal which is attached to a sparkling chain that catches the light. 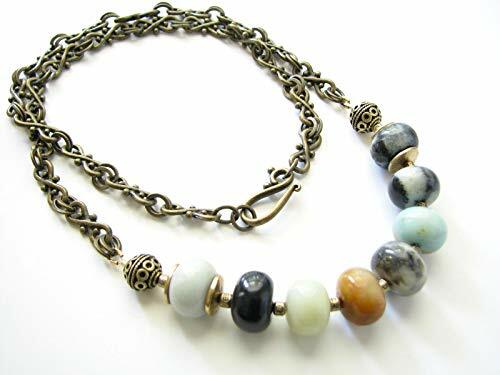 The amazonite crystals are fairly chunky and are approximately 11-15mm wide and 14-19mm long.I use natural gemstones, so your amazonite necklace may have a slight size and shape variation from the main images.The necklace is adjustable to fit 16-18 inches long and fastens with a spring clasp. About Amazonite: Amazonite is named after the powerful Amazon women. Its healing powers are thought to be as strong as the great Amazon river. It is known as the stone of courage and truth. This crystal soothes the spirit and calms the soul. Amazonite represents kindness, peace, creativity, and love. It is a birthstone crystal for March and April, and the zodiac stone of Virgo (23rd August - 22nd September) and Capricorn (22nd December - 19th January). Your jewelry has been designed and handmade with love using genuine gemstones and crystals. It is packaged in a beautiful jewelry gift box along with a fact card telling you all about the crystal and its meaning. My amazonite necklace is a stunning green colour. 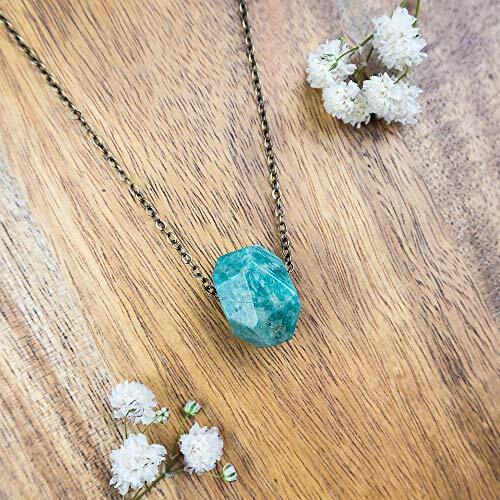 It has been handcrafted in bronze.The amazonite nugget necklace features a polished faceted amazonite crystal which is attached to a sparkling chain that catches the light. 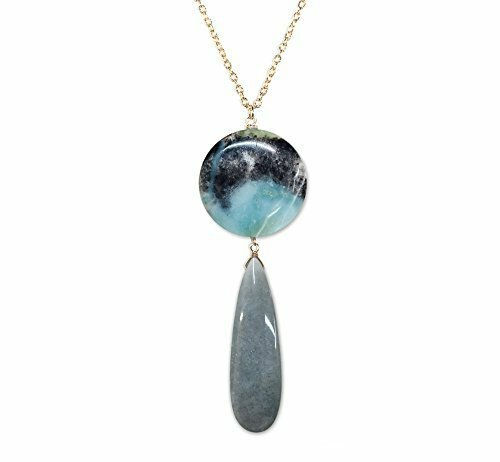 The amazonite crystals are fairly chunky and are approximately 11-15mm wide and 14-19mm long.I use natural gemstones, so your amazonite necklace may have a slight size and shape variation from the main images.The necklace is adjustable to fit 16-18 inches long and fastens with a spring clasp. 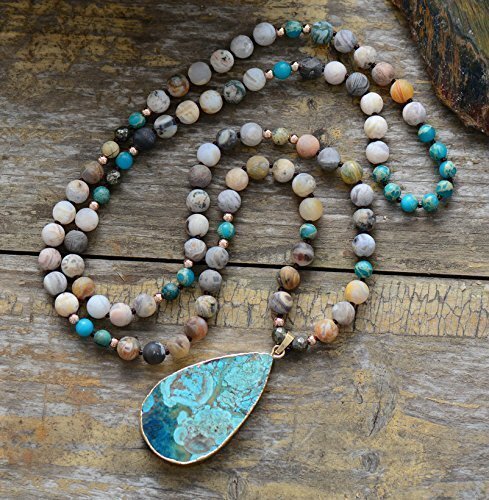 About Amazonite: Amazonite is named after the powerful Amazon women. Its healing powers are thought to be as strong as the great Amazon river. It is known as the stone of courage and truth. This crystal soothes the spirit and calms the soul. Amazonite represents kindness, peace, creativity, and love. It is a birthstone crystal for March and April, and the zodiac stone of Virgo (23rd August - 22nd September) and Capricorn (22nd December - 19th January). Your jewelry has been designed and handmade with love using genuine gemstones and crystals. It is packaged in a beautiful jewelry gift box along with a fact card telling you all about the crystal and its meaning. 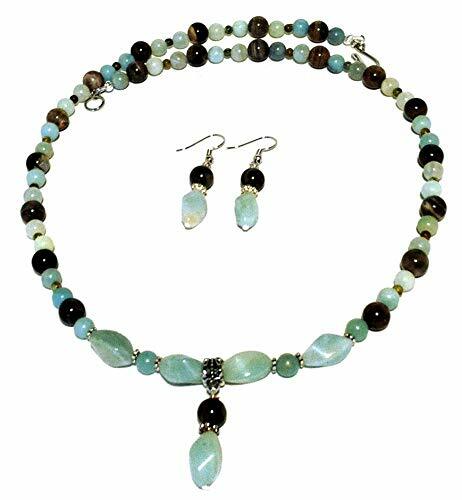 This is a pale sea-blue jewelry set made with 8 mm petrified wood beads; 6 and 14 mm amazonite beads; and 2 mm opalized jasper beads.The necklace is 22" (56 cm) long, pendant length is 1.25" (3 cm). The necklace closes with a easy-hook clasp.The matching earrings are 1.25" (3 cm) long. They have sterling silver ear-wires.Although petrified wood (that can be found on the west banks of Columbia River) is the official gemstone of Washington State, the most famous gemstone of this area is rare blue agate, called 'Ellensburg Blue'. Amazonite gemstone colors are similar (though more green) to those of 'Ellensburg Blue', yet much less expensive. Together, with petrified wood, they create a delicate, elegant and serene composition. 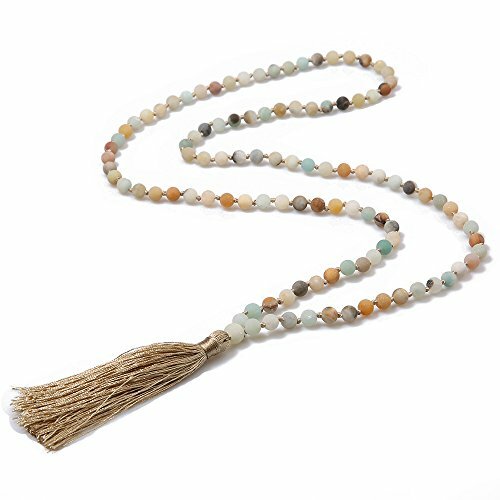 Shopping Results for "Amazonite Long Necklace"